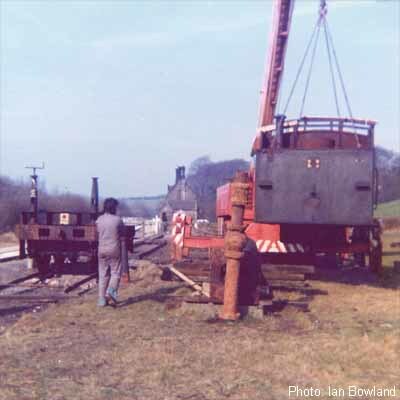 A shot by Andrew Pankhurst taken in 1979 soon after it arrived at Cheddleton. Note Austerity "Josiah Wedgwood", in its early state of restoration, parked behind the 4F. 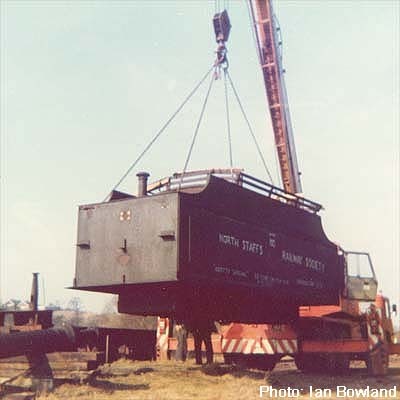 After the tender had been removed from the running line, the opportunity was taken to split the tank from its frame while the crane was on site. It was known at that time that the tender tank would have to be structurally improved before it could be used. It was eventually sent to Stoke for shotblasting. In the foreground is a rusty looking pipe object which is, in fact, the water crane just removed from Hanley station. Where it all began, with the arrival of the tender from Bescot depot on the rear end of a sand train. 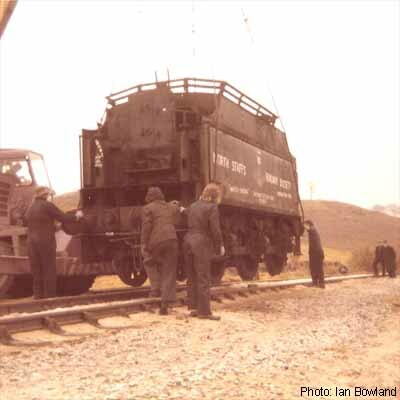 The working members involved had the time between the vehicle being dropped off and the return of the full sand train to remove it from the "main" line. The shot is taken on the overbridge near to what was then Brittain's paper works. 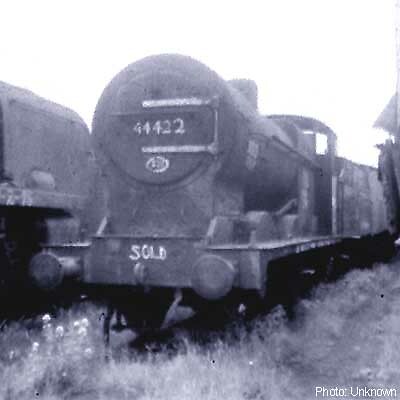 The tender had been used as a water carrier at Bescot Depot after having been removed from "Crab" number 42763. 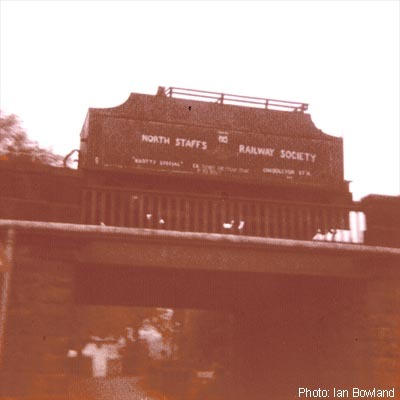 The tender was lifted off the running line onto the first piece of track owned and laid by the North Staffordshire Railway Society. Could the young man in the foreground be a certain Mr.A.Hancock? The tender tank swinging round. 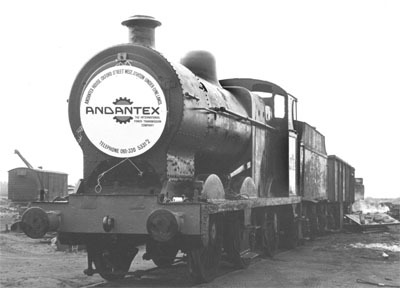 44422 waiting at Barry scrapyard for transport to Cheddleton coutesy of Andantex. Date and source unknown. 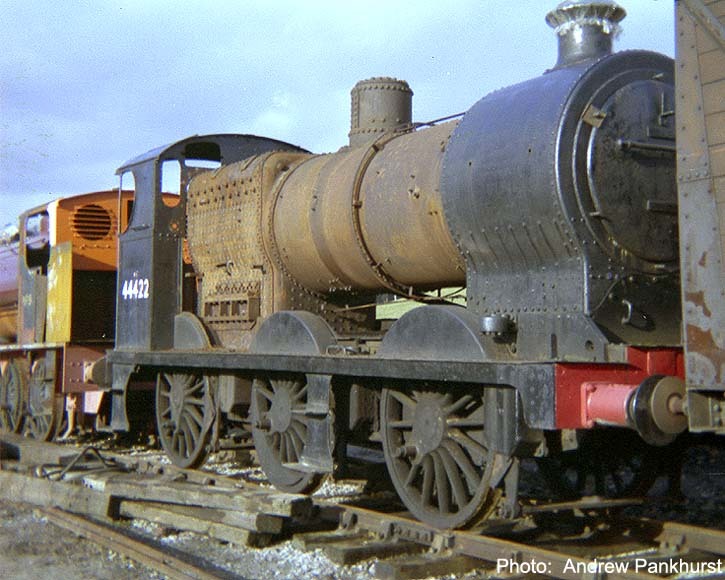 A very fuzzy shot taken at Barry scrapyard prior to acquisition and movement to Cheddleton.